How Can You Be Certain of the Call? How does one know that they are saved? Where can the Christian turn for any ground of certainty before God on the day of judgment? As a pastor, these questions are often found in the fear-filled voices of guilt-ridden Christians in my study. Lead a Bible study on Romans 9-11 sometime and watch fear fill the eyes as folks realize God is actually, actually sovereign over salvation. If He loved Jacob and hated Esau, what hope do I have that my love for stew isn’t going to be the end of me? Bring up the fate of Judas in a class and see if anyone who has any semblance of their role in the death of Christ is feeling comfortable about their standing before God. Passages like these, coupled with an awareness of our sin and God’s Law, tend to shake the confidence of God’s people. So, is there certainty for our faith? Where can we turn? Before we get to the answer, it is crucial for us to understand how uncertainty is the result of a profound misunderstanding of salvation. We tend to think of salvation or being in a right relationship with God in the same way, say, as a great NFL player might think about getting in to the Hall of Fame. Last week, this year’s list of nominees for the Hall of Fame was released. There are a number of guys on that list who are no-brainers . Guys like LaDanian Tomlinson, Brian Dawkins, and, yes, Terrell Owens should automatically be in, no questions asked. (Say what you will about his life off the field, TO was phenomenal). There are others who aren’t as clear cut. Take for example one of my personal favorites: Terrell Davis. TD was an exceptional player for the Denver Broncos in the late ‘90s. His resume is impressive: one 2000 yard season, an MVP, two Super Bowl rings, and a Super Bowl MVP. I mean, it is a dream career for any aspiring football player. There is just one problem, it was too short. Though he was in the league for seven seasons, he only played four full seasons. He faced injuries which shortened his career. So now, the debate among the voters comes down to whether or not Davis’ career was long enough to justify his place in the Hall. Davis has been nominated three times now. My guess is that every year on the day they announce who is in, TD sits by his phone waiting for the call. I bet as he is waiting for his judges to declare him good enough for glory, he runs through his stats in his head, analyzing his hard work, living in fear that he hasn’t done enough, regretting his injuries. He’s looking to his body of work to justify his induction. But there is no certainty there because the ultimate decision lies with his judges, the voters. Given that they have not voted him in yet, there is little certainty there as well. I think too many people lack certainty in their salvation because this is how they think their place in the Kingdom of God will be justified. Like Terrell Davis by the phone, many sit and wait for judgment day to come, running through their performance in this life, hoping that the electing Judge found some reason to love them like Jacob. They know Jesus has died for the sins of the world, but how can one be certain that the death was “for me”? They hope that when all is said and done their performance will be worthy of heaven or that the Voter, the Elector, will find it in His triune heart to choose them. But, they find no certainty. They just wait by the phone. Certainty will never come from looking inward. Analyzing our performances, comparing ourselves to others, weighing the good verses the bad according the Law of God will only leave us in despair or in something foolishly worse…pride! But, trying to climb up into heaven to figure out what God is thinking is no good either. Trying to figure out how God chooses one sinner over another is too jarring a concept to even begin to contemplate. We can’t look inward and we can’t look upward. So, we are left by the phone. Except that this isn’t the end of the story for us. God, as it turns out, has called! He sent you a preacher, He sent you a baptizer, ahead of the day of judgment to let you know His decision. He decided before the foundation of the world that your performance wasn’t good enough, but He’s going to let you in because of Jesus’ performance for you. You are getting in on His record, on His stats, on His perfect life, death, and resurrection. You’re in on His (not your) blood, sweat, and tears. How do I know He did it for you? Because He baptized you. The call came to you in the water. You’re in! He’s sent a preacher (maybe even one in the foolish form of a blogger) to deliver you the good news! Don’t look inward any more, and stop looking upward to figure this out. Just listen to the Word in front of you, just remember the water dripping from your forehead, just take and eat and take and drink the body and blood and, be certain of this, as sure as it is on your tongue, Jesus has given Himself for you. 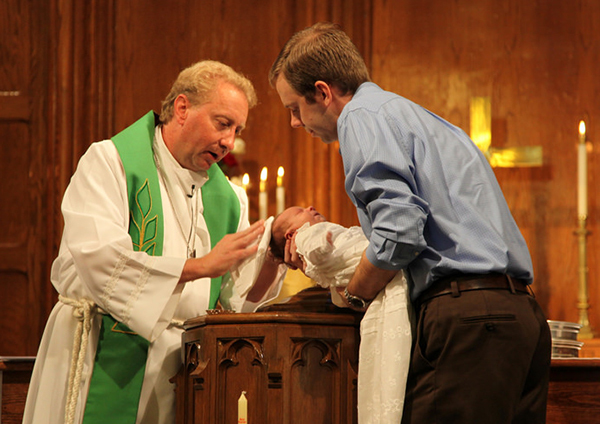 As Luther teaches us to say in the Large Catechism, “But I am baptized! And if I have been baptized, I have the promise that I shall be saved and have eternal life, both in soul and body.” Be certain of this, the call has come to you ahead of time in the water. You have the promise. You’re in. It’s certain.